When the GI Joe Collectors' Club was selling their Figure Subscription Service to fans, it was with the promise that in addition to the 12 announced figures, there would be a bonus 13th figure available only to subscribers. The extra figure was a total mystery, unannounced until the package arrived in the mail. One early favorite was Skystriker, since there was already modern artwork for him. Spoiler: it wasn't him. Despite the utter lack of all clues, some obsessive fanboys managed to guess who it was anyway. Nerds. 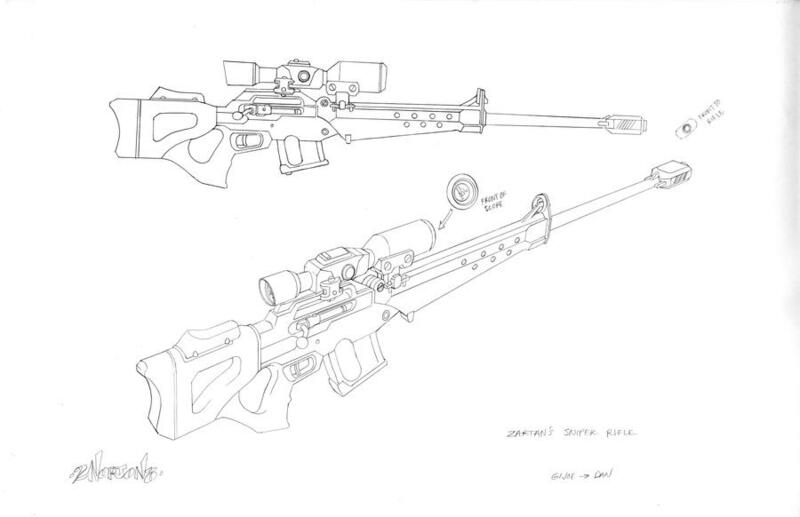 Black Out's expertise with long-range sniper rifles is the result of his obsession with accuracy. Black Out has no natural passion for stalking or shooting, rather, persistence and practice have resulted in a high level of accuracy never sparked by any flashes of brilliance. He mistakenly believes that playing all the notes correctly and at the right time is what makes a song. A cold and methodical loner, his psychological records remain sealed to this day. Black Out feels no love for his brother or sister, and has never understood their strong connection to one another. In their youth, his siblings would play games with the neighborhood kids while he would sit alone and shoot at squirrels with his BB gun. Over the years his eyes have grown cold, and now only ignite when he has an objective in his telescopic sight, quietly judging people from a literal and emotional distance. 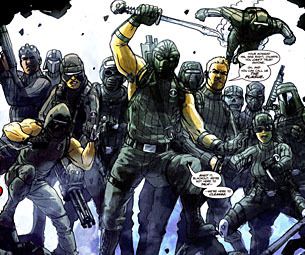 However, it is this detached proficiency that has made him a deadly addition to Cobra's HISS (Hierarchy of Infiltration, Stealth and Sabotage), which may be the closest thing he has ever had to a family. What? "HISS?" Who fell asleep at the wheel over at Hasbro? Cobra already has a HISS, and it's a tank. A whole series of tanks. Black Out's group was known as The Plague, not HISS. Are they not allowed to use the name "Plague" any more? And if so, why not? Yet again we're left to wish the Joe design team was as free with the inside information as the Transformers team is. 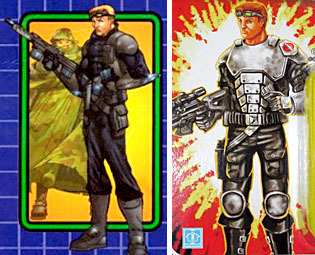 The figure's head is the same one as the SpyTroops release, which makes sense: it's the same guy, even if a few details have changed. For instance, him being more of a psycho now. Of course, the detail is crisper now, because this is 2013 and not 2003. He does still look like a young Dan Akroyd, though - some things never change. 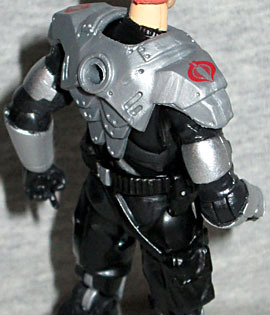 Black Out's Generation 3 design only matches his old one in broad strokes: it's a black suit with silver armor over it, but all the details have changed. That can be chalked up the fact that he's cobbled together from existing parts: Resolute Snake-Eyes' legs and Resolute Zartan's upper body (which really means it's TFAC Snake-Eyes' torso and movie Flash's arms, but the more recent source is clear). 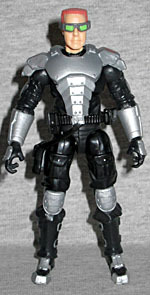 The specific combo of armored plates doesn't exactly copy what he was wearing a decade ago, but it - especially Zartan's layered breastplate - looks absolutely wonderful for Black Out. He definitely passes the squint test with flying colors; or, with flying black and silver, anyway. There's no mistaking him for a Viper or anything. His accessories are a fairly nice mix as well. He's a sniper, right? So his gear reflects that. 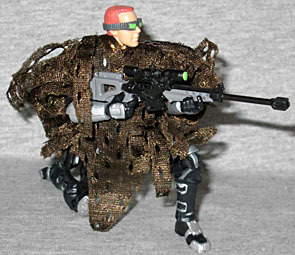 To go with Zartan's Resolute armor, he also gets Zartan's Resolute sniper rifle, the one designed by Dan Norton. 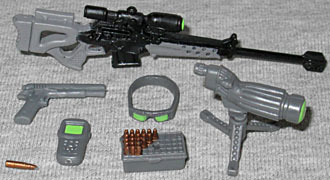 From Low-Light he gets the spotter's scope and tripod, the tactical ballistic computer, and the ToY-nominated ammo box with a single removable bullet! We still love that accessory, even if it means we now have twice as many opportunities to drop it and lose it in the carpet. He has a large pistol, for times when the fighting gets close, and the same goggles that G2 Black Out had - though this time the lenses are green instead of red (same is true for the spotter scope). His head must be smaller, though, because the googles' fit is loose. Since Black Out was a surprise release, his card art was never revealed officially. Unfortunately, without a good artist to "copy," the art is pretty abysmal. Whoever did the mule-ish art for Sure Fire did this one as well (using the SpyTroops art as inspiration for the pose), but having a decent inspiration doesn't equate a decent final product. Batman's a great character, but he can still end up in terrible movies, right? Same thing's true here. This card art is the Batman Forever of GI Joe packaging design: not the worst ever produced, but still a professional-level embarrassment to everyone involved. Next year, Joe Club? Hire some better artists. Black Out was a superb choice for the Figure Subscription Service's bonus mystery figure: he has ties to another figure in the series, he hasn't had a modern update in any of the G3 lines, and he's an interesting character with a unique story. He may not be as famous as Firefly or Techno-Vipers, but just because you don't know him doesn't mean you shouldn't. The dynamic between him and Barrel Roll is nigh-​Shakespearean, and even the IDW comics have seen fit to bring Black Out into their continuity. This figure makes me glad I subscribed, because if I'd missed out on him I'd be kicking myself. Some of the FSS releases were crummy, but Black Out isn't one of them.